• Ignore the salesmen, don't even say "no" ! Seriously, there are salesmen everywhere passing out roses, water, bracelets, etc. They will force them into your hand and tell you they are free, but they aren't. If you make eye contact or say "no" it only opens up a channel of communication. Just ignore them completely! • Be prepared to feel claustrophobic. Italians don't really care about personal space - they're not being rude, its just a different culture! • Put on your walking shoes. 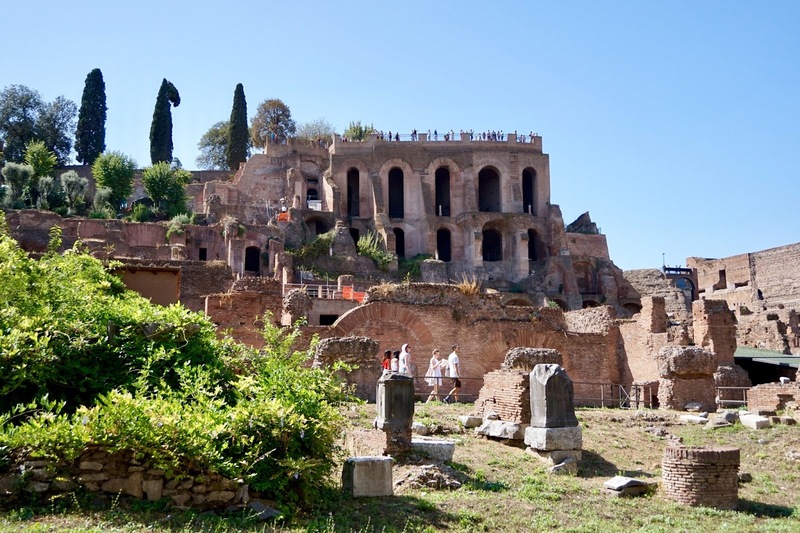 All of Rome is very close together - no matter where you are, nearly everything is walkable! We only took a cab a few times and walked everywhere else. That being said, the streets are all made of stones so wear shoes that won't get caught/stuck/cause you to trip. I don't recommend flip flops - if you want to wear sandals, were ones with a strap for your heel or ankle. • Know basic Italian phrases like hello, excuse me and thank you. Though most places speak decent English, it is still polite to address people in their language. 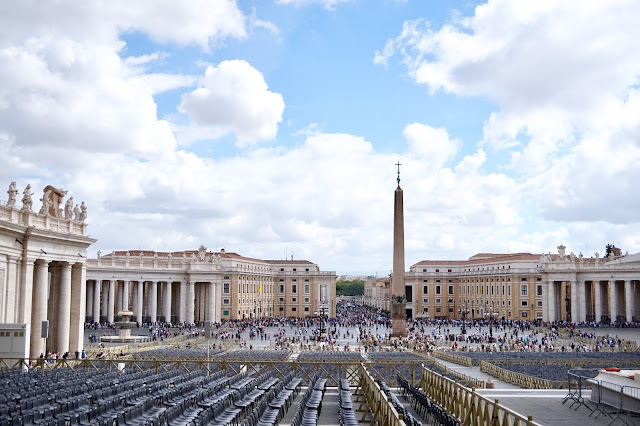 I thought Italian was relatively easy to grasp/understand because it is similar to Spanish and the Italians were very friendly, welcoming and willing to work through the language barrier. • Bring a water bottle with you. Rome has water fountains everywhere to fill it up so you can avoid paying for water everywhere you go. European restaurants often charge for water because they serve it from the bottle. • Watch out for pickpockets. We didn't have any trouble, but we've heard stories. Make sure to keep your purse on you at all times - even while eating (I suggest carrying a crossbody). Be mindful when visiting heavy tourist areas, walking in thick crowds or when walking down the dark streets at night. • Ristorante Maccheroni - my favorite meal in Rome! I've been craving it every singe day since. I ordered the carbonara and Cole ordered a pasta in white wine sauce with bacon and cheese. Both were out of this world. Pair it with their house wine (a whole liter for like 10 euros?) and you're set! We sat outside on the street patio - it felt very European/Italian! Good food, good atmosphere, win-win. 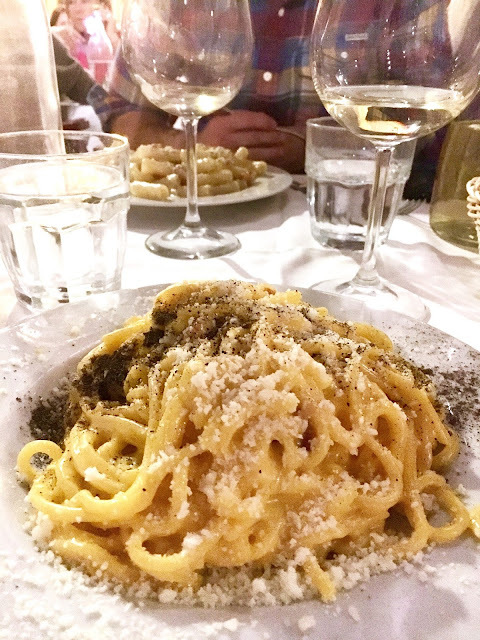 • Armando al Pantheon - a fantastic little restaurant right next to the Pantheon (hints the name). It is very small so I'd recommend reservations - we saw several couples get turned away because it was too full! We ordered the bruschetta al tartufo nero (grilled bread with olive oil and black truffles) for an appetizer, cacio e pepe and saltimbocca alla romana (veal in white wine) for our entree and tiramisu for dessert and split it all. Everything was fantastic, I only wish we had ordered more! • MammaMia Gelato - we had gelato every day while we were in Rome #noshame. 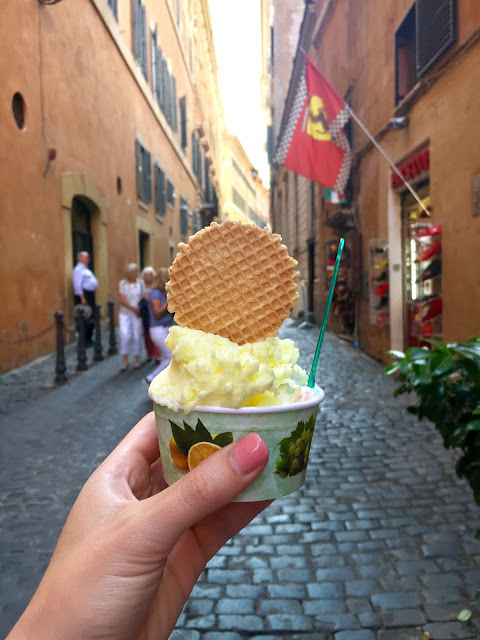 You really can't go wrong.....any gelato is good gelato, but my favorite was the Biscotti flavor from MammaMia in Campo de Fiori! 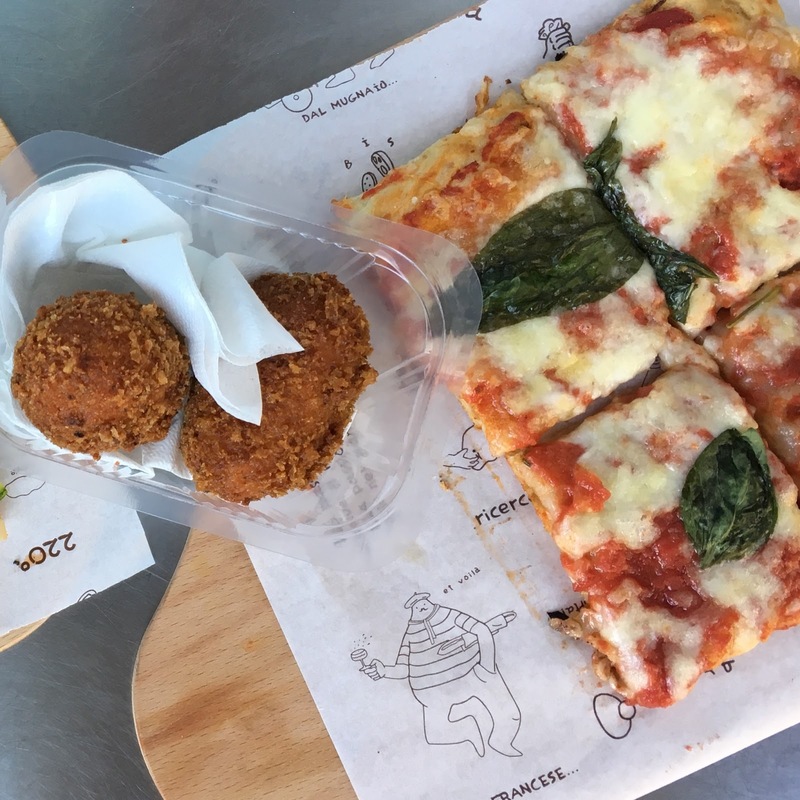 • Pizzeria la Boccaccia - in addition to daily gelato, we also had daily pizza! When in Rome, right? Pizzeria la Boccaccia was recommended to us by our hotel staff on our last day in Rome...... they did not lead us astray. My only regret is that we waited until the last day to try it; I would have eaten it all three days had I known how good it was. The restaurant only accepts cash, so be prepared. They sell their pizza by the slice and it is top notch. I especially loved the pizza that was sprinkled with tons of ricotta cheese. Mm mmmm! • Trevi Fountain - it might be silly, but this was one of my favorite sights in all of Rome! I'd been dreaming of seeing it for years and it definitely lived up to my expectations. The water is so bright and the detailing of the sculptures is incredible. There are a TON of people crowded around, so be prepared to push and shove. Of course, be sure sure toss a coin in over your left shoulder to ensure you'll return to Rome one day. • Spanish Steps - a tourist must - even if just for a photo! It is very crowded and there are a ton of salesmen, so be prepared! • Colosseum - purchase your tickets ahead of time and get there early to avoid lines and crowds. We purchased the headset tour, but tour guides are also available. It is incredible to see such a huge structure with so much history! 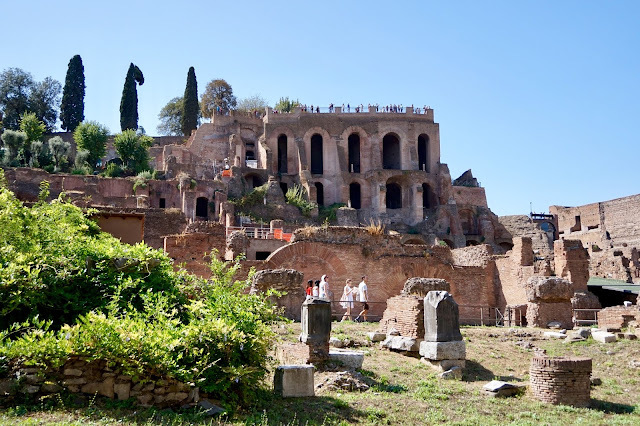 • Roman Forum & Palatine Hill - basically the remains of ancient Rome; it is right next to the Colosseum and tickets can be purchased ahead of time along with your Colosseum pass. This was Cole's favorite part of the whole trip! It is huuuuuuge, so give yourself plenty of time and be prepared to walk a long ways. There is an incredible amount of history here and everything is just beautiful. To me, the views were kind of like how I imagine Bible times mixed the Italian countryside - truly fascinating, pictures can't do it justice. We did not have a tour guide, but wished we would have, just so we knew more about what we were looking at. Since everything was in crumbles, it was hard to imagine what it used to look like without having someone to explain it! 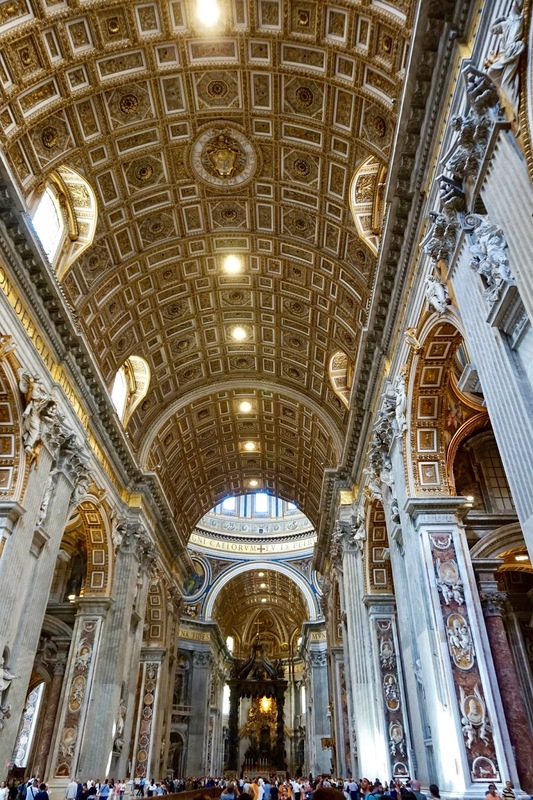 • Vatican City / Sistine Chapel / St. Peter's - plan to spend half a day here, at least! Be sure to wear clothes that cover your knees and shoulders or else they may not let you in. We had a tour guide from City Wonders Tours; he was great and very thorough. Without a tour guide, I think we would have made it through in much less time, but wouldn't have gotten anything out of the trip or known what we were looking at. There is so much art, art history and religious history here, it is really fascinating. The size of St. Peter's Basilica alone is truly astounding and the beauty in the ceiling of the Sistine Chapel is worth a visit in itself. Again, be sure to purchase tickets ahead of time and arrive early because the lines are NUTS. • The Pantheon - such an impressive and historic building right smack in the middle of Rome! There is no entry fee and the line moves quickly, so there is no reason not to pop-in. • Via del Corso - a boutique - high-end area with stores like Zara, H&M etc. • Via del Condotti - high-end designer stores at the base of the Spanish Steps. This is where I bought my Gucci souvenir! 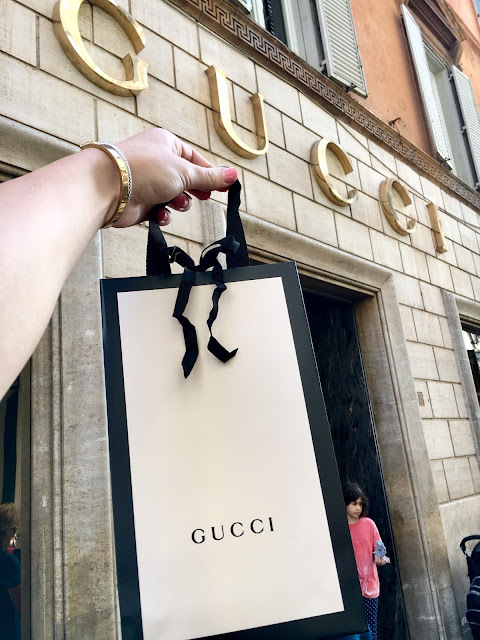 Since many designer goods are made in Italy, it seemed fitting to shop here. • Local Stores - there are TONS of local boutiques, shoe stores and corner shops selling adorable clothes and incredible designer dupes for next to nothing. I'm kicking myself for not buying anything! 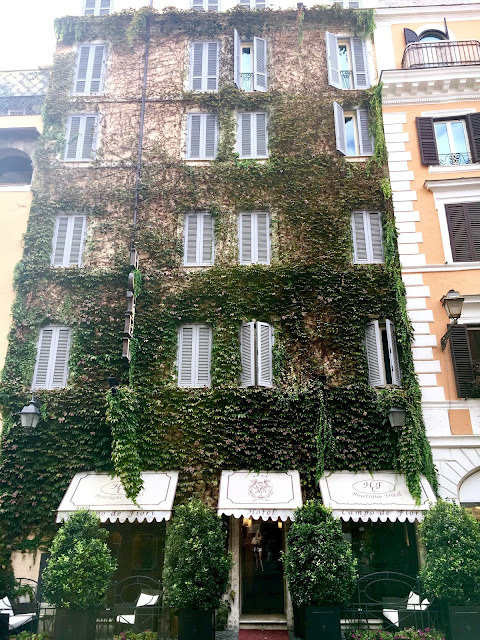 • Boutique Hotel Campo de Fiori - I cannot recommend this hotel enough! When we were on our way to Rome from Paris, our AirBNB (that we had paid for and booked months in advance) canceled on us with no notice and left us stranded with no where to go. It was a complete disaster that made us never want to use AirBNB again. 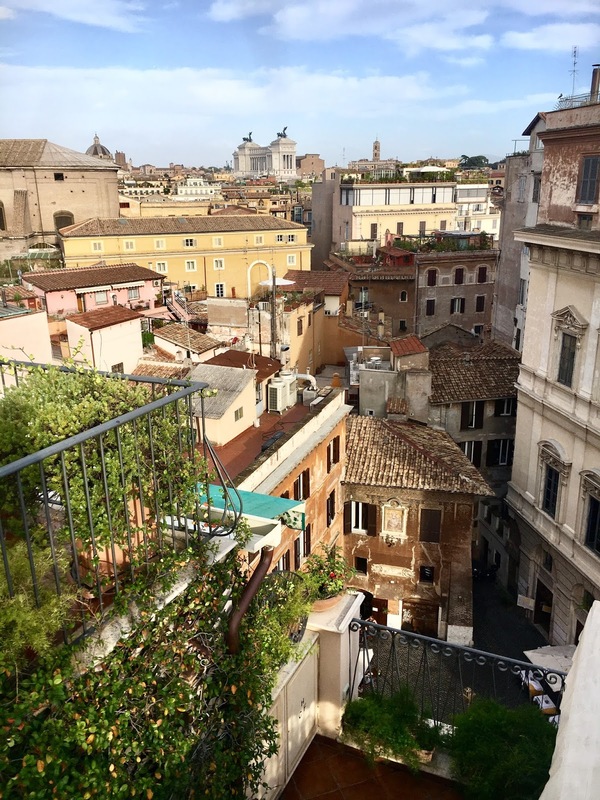 The Boutique Hotel Campo de Fiori came to the rescue and put us up in a gorgeous room at the last minute. The staff was SO friendly; they went above and beyond to make sure we were comfortable. The hotel served a delicious (and free) breakfast that I looked forward to each morning. The best part of all was the view from our rooftop; it was truly magical and more than made up for all the AirBNB drama! We loved to sip rosé and limoncello each evening while the sun set before heading to dinner. If you are ever in Rome, stay here! You won't regret it. Regardless, the Campo de Fiori / Jewish Ghetto area was excellent, convenient, and very, very walkable. Rome was the perfect ending to a perfect European vacation. Everything about it was enjoyable and beautiful - I really can't explain it or recommend it enough! Walking around every corner will leave you speechless and in awe. You will just have to experience it for yourself to truly understand. 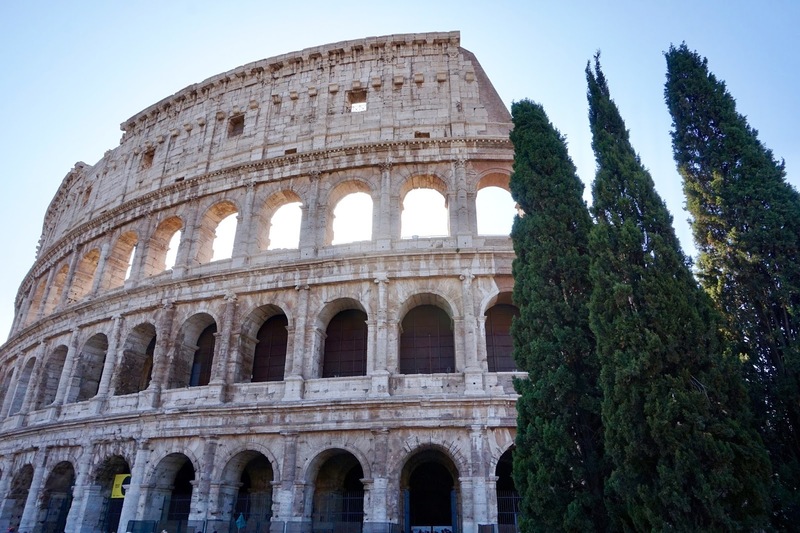 Have you been to Rome or other parts of Italy? What were your thoughts / what would you recommend? Our trip made us want to return to Italy and explore every corner of the country - I'd love to hear your recommendations for Rome and beyond! It was seriously a dream vacation; I'm so grateful we got to experience it and hope to again some day. Gratzi! Ciao! Hope you have a fantastic week. 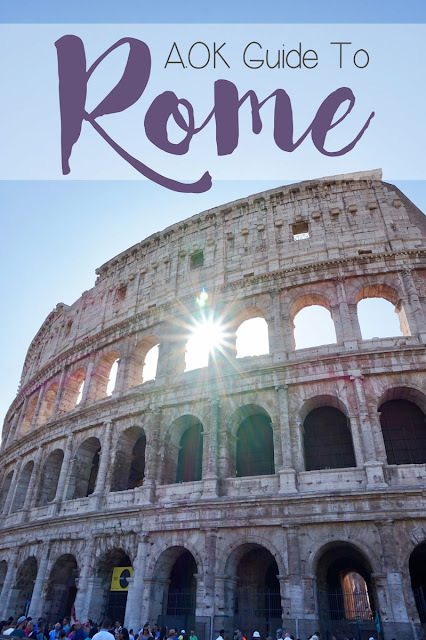 Perfect and yet amazing guide for the ones who are planning their trip to ROME, this guide will help them a lot. 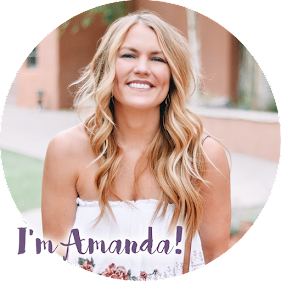 Thanks for sharing with us.